Apple has sent out invitation to a media event that will be held in Cupertino at Apple’s campus on March 17 at 10:00am Pacific time. 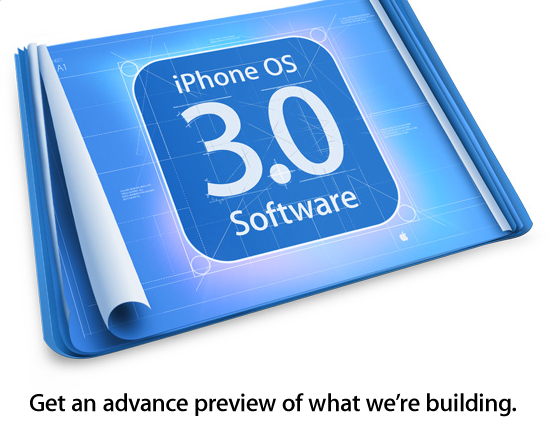 The event will focus on iPhone software version 3.0 and will give the press “an advance preview” of what Apple is building. Based on that line it is a pretty safe bet that we won’t actually be getting anything other than a demo, the actually firmware will most likely not ship until sometime this summer. This media event will be held about 1 year after the iPhone SDK roadmap event where Apple unveiled the SDK and demoed several applications from big name developers. Since last years event was all about features that developers can make use of, it would be logical to think that Apple would do the same this year. But, already the fairly reliable Boy Genius Report is claiming that MMS and iPhone tethering will be among the announcements made at the March 17 event. Boy Genius Report doesn’t go into much detail but they do say that tethering will come over USB and Bluetooth. Many (including me) are also hoping to hear a little bit more about Push Notifications, you remember that cool feature that allowed developers to push notifications and icon badges to your iPhone by allowing your iPhone to keep a persistant data connection between it and Apple’s push notification servers. Yeah, the one that was announced last June at WWDC and was later pulled from iPhone firmware 2.1 Beta 4. Well, hopefully Apple will make good on its promise of giving us some sort of Push Notification-like service, late is better than never.